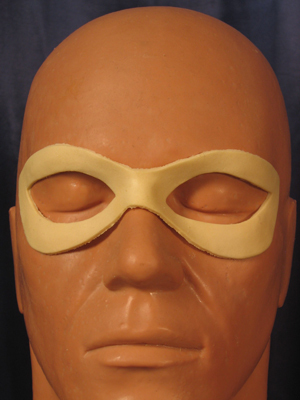 Foam latex hero eyemask piece. Foam latex prosthetics are very soft and spongy and that's what makes them so much more comfortable and wearable than rubber latex pieces. However, due to the spongy nature we recommend pre-painting the outside of the foam prosthetic with a layer of Pros-Aide prior to application, then dust with powder to get rid of any tackyness. This will prevent the prosthetic from absorbing makeup. Care should be taken when applying and especially when removing foam pieces due to their delicate nature to prevent tearing. Check the piece for proper alignment. Know where you want to apply it before you begin to glue it down and make sure you have an appropriate adhesive remover! Clean skin to remove any dirts and oils. For larger pieces, lengthy performances under hot lights or for people with heavy sweating you can use Top Guard or Dry Anti Sweat under the prosthetics to reduce perspiration. Choose an Adhesive to suit your needs, consider the length of time the prosthetic will be worn, the size of the piece, and if the person wearing is has sensitive skin. Check the tips for the adheive you choose to find an appropriate remover. Pros-Aide adhesive is our recommended go to for most applications. The water based adhesive is very strong, safe to use on all skin including sensitive areas and gives a strong bond and has high water resistance. It is non-toxic and completely safe and has been used in thousands of projects in filming major motion pictures, stage and TV. Spirit Gum dries to a matte finish and is good for small prosthetic appliances and lace hair goods. Water-Soluable Spirit Gum is also available and is perfect for young children or if a prosthetic needs to be removed quickly between scene changes. Telesis 8 Adhesive is the most popular and widely used adhesives in the film industry today. It's incredibly strong and durable and is perfect for bonding silicone and latex pieces, especially around the eyes and mouth or other areas that are troublesome to glue down. Telesis 8 will not damage silicone or latex pieces. This step is not always necessary but will make your prosthetics look much more realistic. Stipple on a thin layer of Pros-Aide Creme or Liquid Latex around the edges of the prosthetic to blend the edges into the skin. You can decrease drying time by using a blow dryer on a low setting. Apply thin layers until the ridge along the edge of the prosthetic has been blended in to a seamless finish. We recommend using Pros-Aide Cream over liquid latex because unlike latex it can be removed with certain adhesive removers. Creme Based Makeup like Ben Nye's Wheels or Creme Liners are the most common. They blend extremely easy for realistic looking effects and are a great choice for different cuts and wound effects. If you choose to use cream makeup keep in mind that they can discolour when used over latex based products including Woochie, Rubber Wear, and Don Post prosthetics or if you have used liquid latex to blend over the edges of your prosthetic. You can prevent discoloration by applying a thin layer of Castor Sealer over the entire prosthetic, blot off any excess and then Powder to set before applying makeup. This is not necessary if you are using a plastic based prosthetic like Watermelon. Rubber Mask Grease is a castor oil based creme makeup works similar to other creme makeups but is designed to work over latex products without the need to add more castor sealer to prevent discoloration. Water Based Makeup or face paint are easy to use and very gentle on the skin. They are great for solid colours like green witches or for use on young children. Water based makeup can be more suseptable to sweating or rubbing off so a Makeup Sealer like Final Seal may be desired for added durability and protection against smudging. Alcohol Based Makeup like Skin Illustrator or Reel Creations are the most durable and realistic makeup. The makeup is applied using 99% alcohol and goes on more translucent so it can be easily layered for effects that look under the skin instead of on top of the skin. Once applied they are incredibly durable, water and smudge resistant, and can last a few days with proper care. Alcohol based makeup is harder to work with than creme or water based makeup so it's not recommended for beginners. Once the makeup is finished apply Blood as a finishing touch if necessary. Thick bloods are great for using inside gouges and wounds to create texture and depth, they can also create small scrapes. Stage bloods drip for fresh cut effects. Remove makeup with a Makeup Remover. Then using a brush or cotton swap slowly work your Adhesive Remover underneath the edges of the prosthetic until the glue softens and you can peal the piece away, see your adhesive for a list of appropriate removers. Then clean your skin to remove any remaining traces of adhesives and makeup. Be sure to clean off the prosthetic as well. Rubber latex prosthetics are fairly durable and can be reused many times as long as you are gentle and treat them with care. Foam latex is very delicate and can be damaged easily, remove with care. If you have any questions or are unsure about any steps involved with applying a prosthetic appliance please feel free to contact us.